When I ordered a set of bulgogi in Seoul, the least I expected was to have a huge tray delivered to my table. The tray was filled with delicious food, a steaming hotplate of meat, grilled fish, rice, seaweed soup and 6 other side dishes. Yep, there were 6 in all. It felt like a spread for the rich. I got all these for just KRW12,000 (SGD14/USD11). This whole set for KRW12,000! Look at all those vegetables!! BUT! And it was a HUGE BUT!! I looked on those 6 side dishes with worry, mostly because they were ALL vegetables. For those who know me, this is their time to snigger. AT ME. Yes, I confess that I’m a picky eater and vegetables are right at the bottom of my list. I picked up one of them. It had leaves and stalks. I put it in my mouth and I chewed. It tasted good. Next one, I ate one piece and moved on to the next dish after one bite. I continued tasting each one from each dish. And then I left it alone, happily eating my meat and my rice. And then I heard whispers behind me. The ahjummas (shop assistants here) were all watching me eat, probably because I was eating by myself. I began to eat self-consciously. I could feel their eyes on me with each spoonful that I took. I felt bad for leaving the dishes full so I slowly started to eat the vegetables in front of me. Some were good and enjoyable. There was a few that did not sit well with me and I abandoned it after trying to eat as much as possible without offending them. There was also huge basket of leaves for me to make a wrap with the meat. One ahjumma came over to cut up my meat and pushed the basket towards me, urging me to eat. I sheepishly smiled and reluctantly grabbed for the first leaf, And then almost choked when the taste of mint spread through my mouth. Did I just eat mint leaf??? I chewed as fast as I could. At the end of the meal, I was proud to leave the restaurant, having finished almost all that was on that tray, including the vegetables. So, this incident left an impression on me because I was not allowed to be a picky eater in this situation. Since then, I would say that I have been more open to eating my vegetables, especially when overseas. Are you a picky eater when travelling like me? Has travel changed any habits of yours?Please do share! Sha maybe we could go together. You eat the meat and I will eat the vegetables and we will make a fabulous team! Well it does look like a challenge. Sounds as if you did very well. I ordered tripe soup in Sarajevo because I was reading some novels where our hero was always eating it in Turkey. The waiter asked me if I knew what I had ordered. I said yes. It was really delicious. Travel is about new experiences. When travelling I score an epic fail when it comes to foreign food. I’m not adventurous – it has a lot to do with my peanut allergy, but nevertheless, I sadly dont get to try a lot of the local cuisine, depending where I am. I can’t stomach spicy food either, so I am naturally picky! I’m not really picky and I always want to try new foods and flavours but there are few things I don’t eat (or at least try to avoid eating) even when travelling – one of them are mushrooms. I just don’t like them. They just don’t taste good. Sometimes I’ve been offered some food with mushrooms in it and I’ve eaten it just because it would be rude to refuse.. But ugghhh, hopefully that won’t happen too often! I think I’m picky in the complete opposite way of you. Since I’m a vegetarian I LOVE vegetables 🙂 I totally get a kick out of eating weird and exotic fruits and veggies in other countries. Well since you live in Singapore, I’m sure these are a norm for you. But my all time favorites are mangosteen and dragon fruit! The first time I tried a mangosteen I had no clue how to eat it!! Traveling has made me less picky, though I’ll admit my pickyness has gotten in the way of eating some very delicious things. I don’t really eat Kimchi while here in Korea but am not alone. 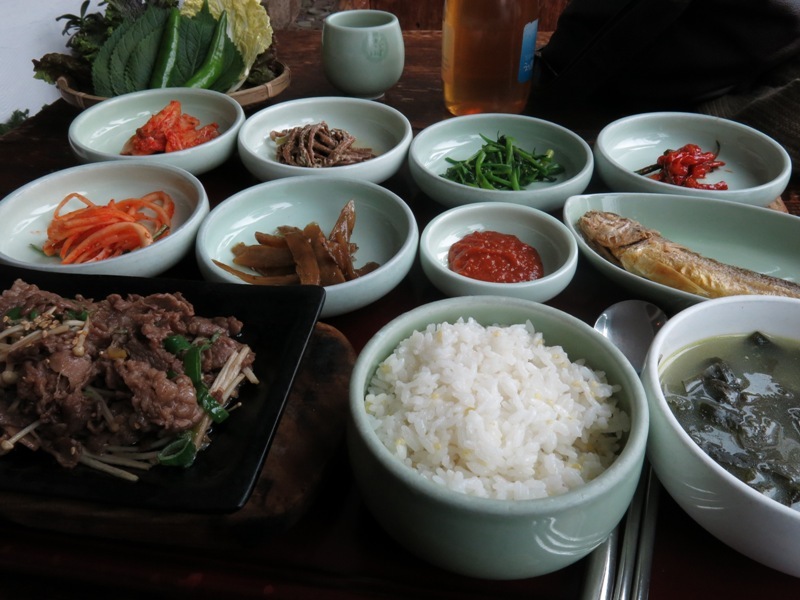 Some Koreans don’t eat Kimchi, believe it or not! Me too! I’m still picky but just not as bad as I used to be. Ah, I love the radish ones and there’s a variety down near us called Gat Kimchi. It’s mustard leaf and really popular on a big island near my town, called Dolsan. Great for you Sha! I’m so glad to read that you succeeded in eating it all. I hate hate hate HATE when I see people leave restaurant with food still on their table. It breaks my heart and it can disturb my mind for days. It’s understandable when you didn’t expect something from what you thought you ordered. The last restaurant I went to, the food looks good but they serve big. If people can’t finsih it, why not get it a ‘to go’. They didn’t do it. They just wasted food. Do me and you a favor, if you are picky with what was served to you, give it somebody else. Sorry, I just hate food being wasted by priviledge people when other less fortunate have to scavenge for it. LoL I know what you are saying here. I used to be very picky about my food, I needed by usual everytime. But when I got myself introduced to Travelling, I understood tasting different food is also a an experience and comes as a package for love of travel. Thankfully I am not so picky now, I can eat and enjoy different food.